From our kitchen to yours, we are pleased to feature this tasty recipe shared via simplysissom.com for you to try with our organic Southern Fried Chicken Seasoning. This smashing recipe for chicken tenders is done in a clean eating style. The crunchy coating, similar to traditional fried chicken, is made from a healthier mix of almonds, garlic, and spices. The chicken is skillet fried in 10 minutes using unrefined coconut oil, instead of deep frying in hydrogenated oils. 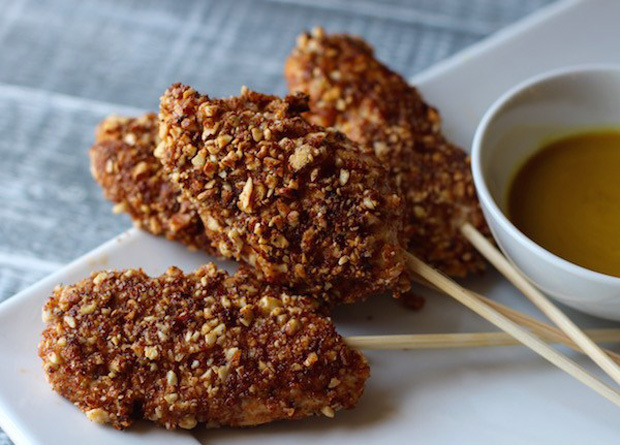 We suggest adding our organic Southern Fried Chicken Seasoning to the almond mixture. The Almond Crusted Chicken Tenders recipe is from Bailey of the Simply Sissom blog. Click on image for the recipe. From our kitchen to yours, we are pleased to feature this tasty recipe shared via iamafloodblog.com for you to try with our organic Southern Fried Chicken Seasoning. 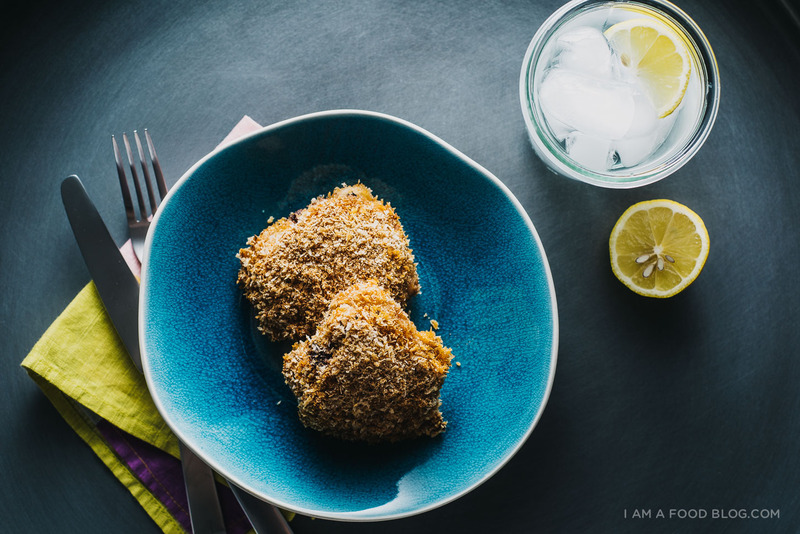 If you are a fan of oven-frying vs deep-frying, we think you’ll love this crispy fried chicken variation using panko and buttermilk by Steph of the ‘i am a food’ blog. Consider using our organic Southern Fried Chicken Seasoning, which already includes the four spices in the recipe. Click on image for the recipe. And, if you prefer deep-fried chicken, then Steph also has a lip smacking recipe for Buttermilk Deep-Fried Chicken Wings. Use this to make Grandma’s traditional fried chicken. Great on chicken breast as well. Give the gift of organic baking spices this holiday season! 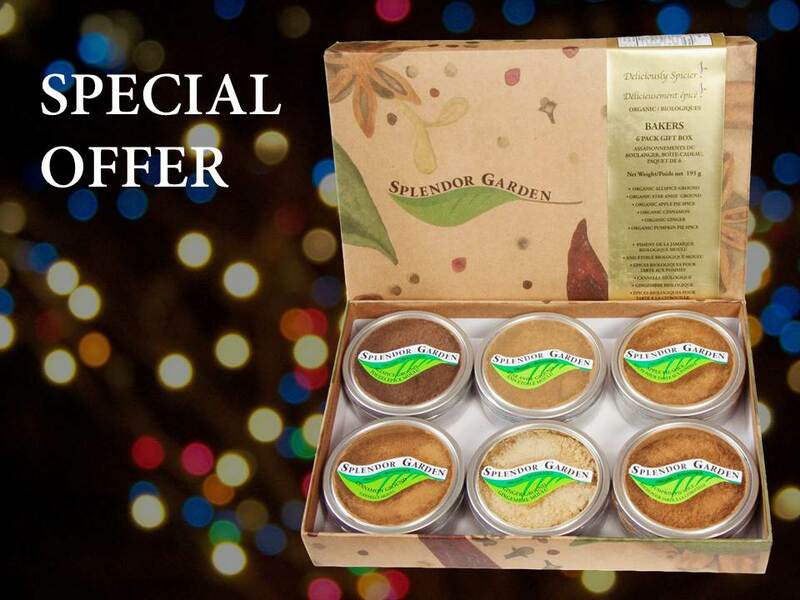 Get ready for the holidays with this SPECIAL OFFER from Splendor Garden! The Baker’s 6 Pack Organic Spice Sampler makes the perfect gift to surprise a special friend, loved one or close colleague who enjoys baking for the festive season as a party gift or as a treat under the Christmas tree. Six organic spices in this sampler can be used for baking year-round and are also ideal for festive goodies – from cookies, nut/spice cakes to even glazing ham! The spice sampler includes: All Spice, Apple Pie Spice, Cinnamon, Ginger, Pumpkin Pie Spice and Star Anise Ground. All our herbs and spices are certified organic, non-gmo, non-irradiated, and not treated with any chemicals! $25.00 (discount of $4.99) + free shipping*. *This special offer is only available with a coupon through Amazon.ca. 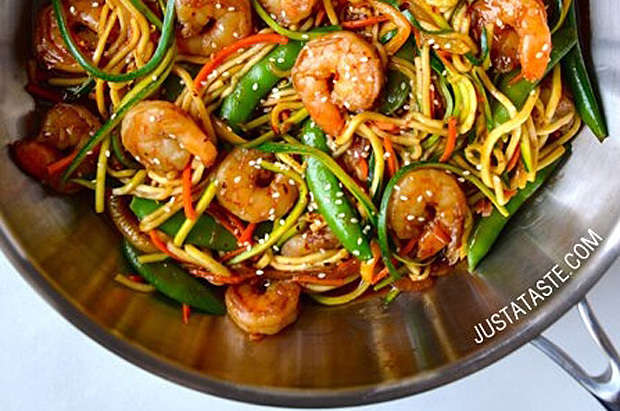 From our kitchen to yours, we are pleased to feature this tasty recipe shared via justataste.com for you to try with our organic Seafood Seasoning “Salt Free”. We bring you another wonderful seafood dish that can be easily made in 30 minutes! Zucchini noodles (made with either a spiralizer, mandoline or a vegetable peeler) are one of the stars of this recipe by Kelly of the Just A Taste blog. The other key ingredient is shrimp, which can be seasoned with our organic Seafood Seasoning. Click on image for the recipe. From our kitchen to yours, we are pleased to feature this tasty recipe shared via scalingbackblog.com for you to try with our organic Seafood Seasoning “Salt Free”. 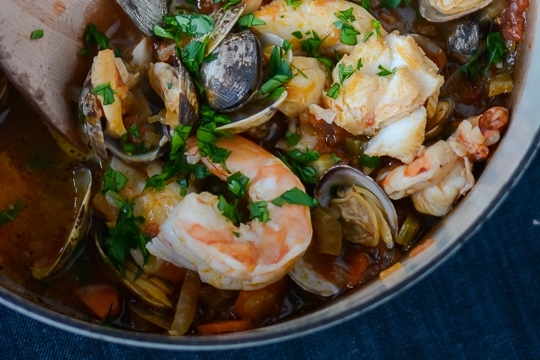 Imagine making a seafood stew in 30 minutes! Yes, you can with this simple and comforting Seafood Stew recipe by Tina of the Scaling Back Blog. Packed with clams, fish and shrimp, it’s a great recipe to try with Splendor Garden’s organic Seafood Seasoning. Click on image for the recipe. From our kitchen to yours, we are pleased to feature this tasty recipe shared via homesweetjones.com for you to try with our organic Salmon Seasoning. This creamy and light wild salmon spread, served on toasted baguette, is an appetizing treat that you’ll find it hard to stop eating! 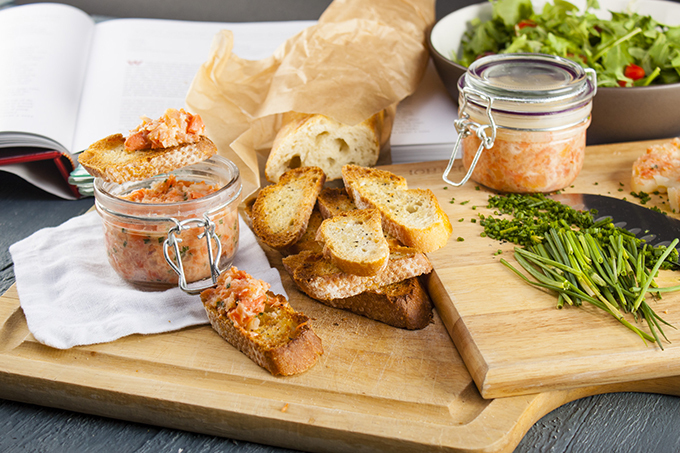 Inspired by a dish from Thomas Keller (an American chef/restaurateur ), the recipe for Potted Salmon Rillettes is from Maggie of the blog Home Sweet Jones. It’s an ideal recipe to try with our organic Salmon Seasoning, that is – for seasoning the steamed salmon part of the recipe. Click on image for the recipe. 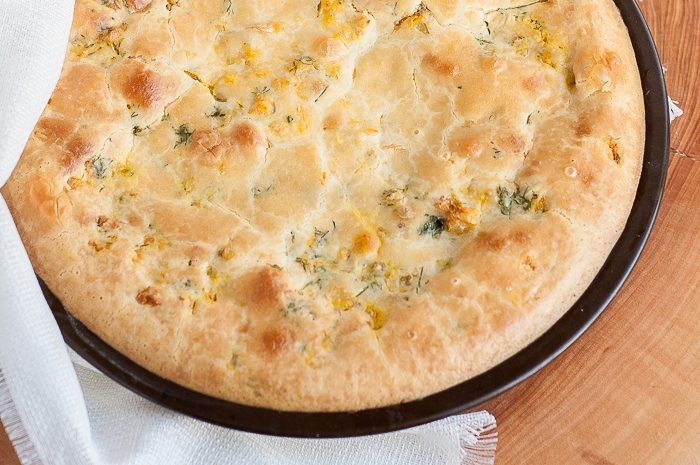 From our kitchen to yours, we are pleased to feature this tasty recipe shared via gastrosenses.com for you to try with our organic Salmon Seasoning. Making a pancake pie with salmon is a great idea and the brainchild of fellow Canadians, Lily and Dmitriy from the blog Gastro Senses. We like that they are fans of organic products! And, we think our organic salmon seasoning works well with this easy recipe. Our suggestion is to add a tsp (or to taste) of the seasoning when sauteing the onion mixture, which is combined with the salmon to make the pancake pie’s filling. Enjoy! Click on image for the recipe.